Please note that the legacy URI will continue to 301 redirect to the new URI. While we suggest you change your code to reflect the new endpoint, in many cases it’s a simple fix by setting FOLLOWLOCATION to “true” if you’re using cURL. 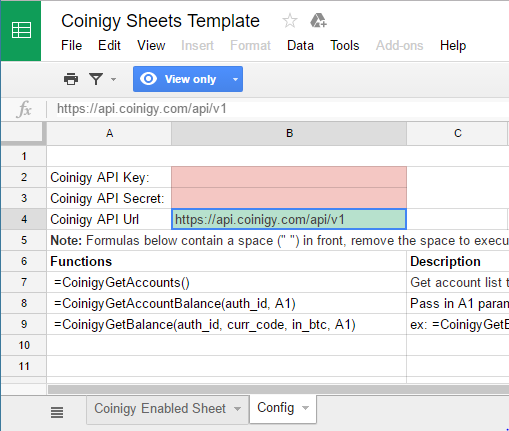 If your GoogleSheets implementation is having issues connecting, please click on your ‘Config’ tab, and update the “Coinigy API Url” field to the new value: https://api.coinigy.com/api/v1 (Screenshot below). We have updated our GoogleSheets template (Available via Apps > GoogleSheets) to reflect the new URI. Should you have any issues whatsoever, please feel free to reach out via support.